I love this design very much because it was really designed and stitched with love. The first prototype was for the marriage of my friends Dave and Nancy and for them I wanted something romantic with an old fashioned style. I found a beautiful quote which seemed to me perfect for my friends: “Marriage is ever made by destiny” by George Chapman, English poet and dramatist c. 1559-1634. In this pillow there are several old samplers symbolisms which add value and meaning to the marriage and the love relationship. I then decided to stitch one pillow for my husband and myself. 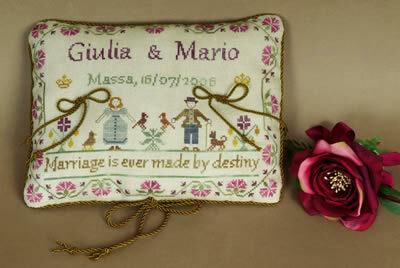 It is never too late to have a wedding pillow, even after years!!! Fabric the original pillow has been stitched on 35 ct overdyed linen 1106 Beige by Weeks Dye Works. A 15 x 13 inches piece of fabric will give you 2 inches allowance seam on each side.